Departing Norfolk - Make a date to visit the Bury St Edmunds unique Christmas Fayre. 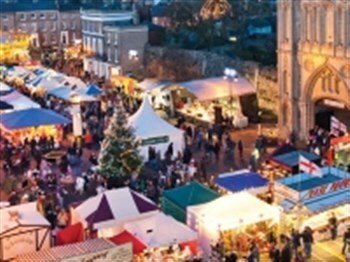 The award winning Bury St Edmunds Christmas Fayre is now in its sixteenth year and gets bigger and better everytime. With over 300 stalls situated all around the historic Georgian town centre it has the perfect mix of old and new. The Fayre has something for everyone and includes childrens opening parade and fireworks, cookery theatre and food area in the Cathedral grounds, free childrens activities and fun fair on Angel Hill and in the Abbey Gardens and much much more.